Recently I had the good fortune to leave London’s hurry, bustle and pace behind, allowing my backpack and I to become reacquainted whilst walking the coast and hills of Orkney. On a bright fresh morning my walking route was simple. Hug the coastline from Stromness, along to Black Craig, Bay of Skaill, onwards to Marwick Head. No rush, see how I feel as the walk unfolds. The weather had turned cold and windy. As I left a road section and climbed the beckoning hill offering a wonderful panoramic view for miles around, I was met by a couple coming in the opposite direction. We exchanged pleasantries. They had started off with a longer walk in mind but turned back due to the adverse weather setting in. I told them of my walking plans, then everything changed. With an outstretched finger he asked: “You see that monument way over there across the hills along the coastline?” Squinting through a pair of binoculars I said yes. “Well that’s the Kitchener Memorial. Lovely walk on the right day. I wouldn’t think you’d get there today though,” he said helpfully and factually. As we said our goodbyes, little did he know he had turned my walk into a challenge. Kitchener’s Memorial here I come. I hope! Suffice to say, having met many interesting people along the way, viewed exhilarating sections of coastline, many, many hours later my backpack and I finally arrived at the end of this self-initiated challenge. The stone-clad tower of Kitchener’s memorial was before me. Whilst I found the monument impressive and the plaque sentiments respective I was left with the question, what about the crew, where is their recognition? Surely the tragedy was more than about one man? In typical tourist mode I pondered the injustice but carried on exploring Orkney during my remaining days. Somehow the whole experience didn’t feel right. It was whilst leaving Orkney on my return ferry journey to Scrabster I was given a swift reminder, people who recognise injustice do something about it. I read Neil Kermode’s excellent article in The Islander magazine, confirming a project had been set up by The Orkney Heritage Society to restore the memorial. I didn’t realise until I read Neil’s article, over 700 men were lost at sea on that fateful night. The Orkney Heritage Society intend to construct a wall next to the existing Kitchener Memorial, engraved with the names of those men. To all those involved with the project, I’m sure the families of the HMS Hampshire crew and passengers, and the inhabitants of Orkney who keenly felt their loss, will be indebted as their loved ones are eventually and finally recognised. They died serving their country. For anyone reading this article who would like to know more about the Kitchener Memorial project, or make a donation, please email kitchener.memorial@gmail.com or go online to justgiving.com/orkneyheritagesociety, Facebook (@Kitchener.Memorial) or Twitter (@kitchenerorkney). Have you heard the good news? Yesterday Orkney Islands Council’s Planning Committee granted planning permission for our HMS Hampshire commemorative wall, to be built alongside the Kitchener Memorial at Marwick Head, Orkney. We issued the following press release to the media. Volunteers working to “better remember” 737 men who died when HMS Hampshire sank off Orkney during the First World War have secured planning permission for a commemorative wall engraved with the names of all those lost. 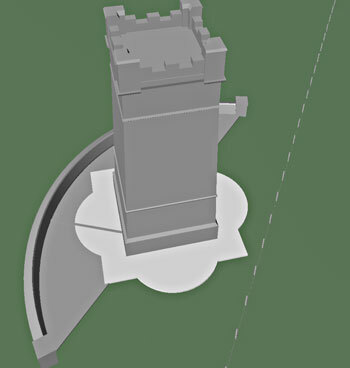 The wall will be a little over a metre high, made of Orkney stone, and laid out in an arc shape alongside the existing Kitchener Memorial tower. The wall will be capped in sandstone with a pillar at each end. Artist-designed carved sandstone panels will be incorporated in the pillars and the internal face of the wall will be faced in dark coloured granite to list the names. The Kitchener & HMS Hampshire Memorial project will also see the Kitchener Memorial restored. Work began on the tower’s restoration last week (week beginning Monday 29 June) and involves restoring the stonework to its original condition, inspecting and repairing the roof, reinstating the ventilation and restoring the inspection doorway. 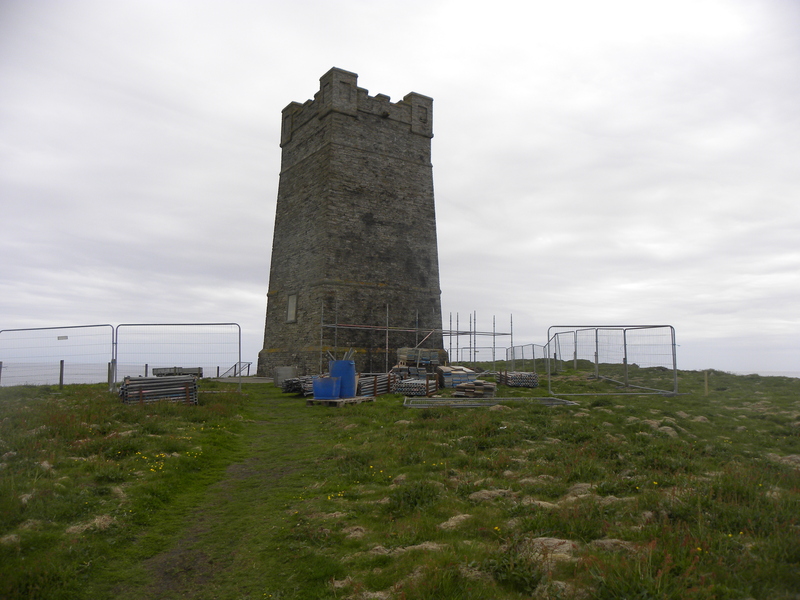 The contractor chosen by Orkney Heritage Society for the tower restoration and to build the wall is Casey Construction Ltd of Kirkwall. Permission for the wall was granted by Orkney Islands Council’s Planning Committee today (Wednesday 8 July). Now the volunteers have to secure funding to ensure the commemorative wall can be completed. They estimate they need at least another £15,000 to realise the project. The Kitchener Memorial, a 48-feet high stone tower, was unveiled in 1926 to commemorate Earl Kitchener, Britain’s Secretary of State for War, who was among those lost when HMS Hampshire sank just off Orkney’s Atlantic coast on 5 June 1916. The restored tower and wall will be officially unveiled at events marking the centenary of the sinking on Sunday 5 June 2016. Relatives of some of those lost are expected to attend. The project committee would like to hear from anyone who may have artefacts linked to HMS Hampshire for a planned exhibition around the time of the centenary. Please email kitchener.memorial@gmail.com or write to Orkney Heritage Society, PO Box 6220, Kirkwall, Orkney, KW15 9AD.